I understand it’s very difficult to know what to sell and what to keep. It isn’t that antiques aren’t selling as well as they used to, it’s that different things are selling. The economy is still slow and things aren’t selling for as much as they once did, but things are getting better. It’s all about knowing what to sell when. Many items are coming back in a big way. I will be giving you a list of items that are mostly affordable, things you can use in your homes. Interestingly enough, many items that appear to be junk are actually quite sell-able. Anyone who watches American Pickers knows what I mean. An old rusty lamp is worth more than most china. The age group buying antiques is changing, which makes all the difference as to what sells. 60-80 year olds are cleaning out their houses while 28-45 year olds are staring to collect. Supply and demand is what makes something rare. Since the economy’s 2009 decline, people are cleaning out their basements and garages to make extra money. When someone doesn’t know the value of something and sells it on ebay for .99 cents, that one sale effects the purchase price of every other item like it on the market. What was once rare, is now common due to “The Ebay effect”. When you can’t find something on ebay, sometimes that can be a good thing. If you are unsure of what an item is worth, we are here to help you. I have often heard people say how antique dealers can be grouchy and unfriendly. Than is true, however, the older antique dealers know what they are talking about. As they say, “We don’t pay for sentiment”. It is hard to sell something your Mother loved, but it’s better to get the real scoop than to think it’s worth thousands and it really isn’t. Better to get an accurate picture of what you are dealing with, in my opinion. 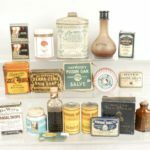 I hope this brief guide will give you an idea of what items to sell and what items to keep. What’s hot in California isn’t always hot elsewhere. For example, we went to an auction that had a huge solid wood mid-century modern bedroom set that would have sold for $10k in California, but here in NE, they couldn’t give it away. Why? We have low ceilings and less space on the most part. In LA, very few people would pay money for an old stoneware crock, but here in NE they always sell for good money. If you are willing to sell an item on ebay, you might get more for it than selling it locally. I will be doing a blog soon to help you learn about the good, the bad and the ugly of selling online. 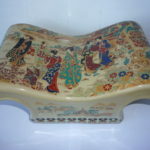 Japanese antiques usually sell for far less than Chinese antiques. Asian antiques are always valuable, however, most are VERY good fakes. 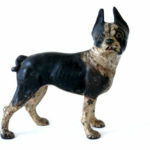 I know of a fancy store here in NE that sells Asian finds and they are all reproductions. 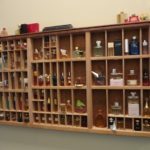 The owners of the store might not even know they are selling fakes, but fakes they are. We are very lucky to have a wise antiques consultant who has been in this business for over 40 years. He can spot a fake better than anyone. He told me China doesn’t allow fine antiques to leave their country, so what little there is out there is usually hand made items that are meant to look like antiques but are actually modern or even new. You really need to be highly educated in this area not to get taken. Don’t expect to find an Asian vase at flea market that is worth thousands of dollars. That happens very rarely. Buy what you like, that way you will want to keep it regardless of it’s value. When buying military items, I can tell you Vietnam and Korean war items don’t sell as well as WWII and the Civil War. Military items always have a following. Swords, guns and uniforms sell for big money. Even small things like hats and patches do well. 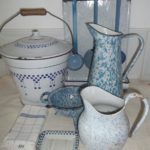 Vintage and antique fishing equipment sells well also. Because of the show American Pickers, men are collecting as much if not more than women. The “man cave” has become as important as a woman’s closet. Because of the rise in popularity of the “Man Cave”, all kinds of antiques that most of us would pass on are more expensive than a nice Waterford vase. Pubs and car shops love auto advertising. Condition is a big factor is this area of antiques. Neon always sells well. Many of these signs have been restored, which costs a lot of money. If you want one cheap, expect to restore it yourself. You might be able to find an old sign for $300 but after restoring it, it will cost thousands, due to the amount of money invested. With restored items, be respectful of the process. No one works for free. What took an artisan hundreds of hours to complete is obviously worth more than a guy who spray painted over the rust in his back yard. 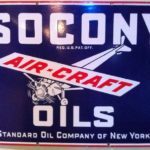 Oil advertising has always been popular. Men love it for the sides of their garages and barns or for their man caves. A sign like this will sell for over $500. Be aware there are a TON of reproductions out there. If you see one on ebay for less than $200, it’s a repro, even if the person doesn’t know it is. The rule of, “If it’s too good to be true, it is” applies to most antiques. Be very leery of anything made in China or India. Merchants from those countries are very nice to deal with but do not have the same laws we do on copyrights. The best fakes in the world come from those countries. Many shysters buy from China, bring it to the US, distress it with bleach and acetone and sell it as an original. You can always come to our shop or email us photos if you are not sure about something. If I don’t know, my Dad or Uncle probably will. As you can see, the 70’s are a cut off for many desirable items. A rule of thumb is, if it’s after WWII it probably isn’t worth as much as before 1940. There are exceptions, but that rule works for most things in the antiques business. Steiff stuffed animals are always popular, however their value varies according to age and condition. Here is a guide that might help you. Topper Dawn dolls are a huge hit right now. My generation is at the age where we are collecting toys from out childhood and earlier, like the 60’s. Toys that came from TV shows are a big hit. Classic monster toys are also highly collectible so are movie props. Shabby Chic will always have a following. There will always be women who love tea. People are using ta cups and saucers in all kinds of crafts are well. They don’t always sell for BIG money but they are collectible and very in style. Price depends on brand, age and condition as with most things. People use tea cups in gift baskets and pour candles in them for gifts. Regardless of if your tea set is sterling or silver plate, tea sets are in style. Some sell for thousands while others can’t be given away. My 100 year rule applies here. If your tea set is over 100 years old, it’s probably worth something. DIY crafters are also making beautiful art from old tea sets. People ARE buying them. Tea and coffee is very in style with the younger generation. We had some old advertising tins that were beat to death and people still wanted them for decoration. People love advertising. I don’t know why but it always sells. Alcohol and tobacco advertising always does well too. People like to showcase the products they use. 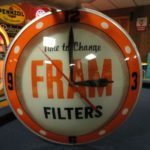 If someone has a bar in their home, a nice vintage cognac sign might be of interest. In a man’s den or game room, an old poster of the Marlboro man would fit nicely, especially now they are not bringing him back to the ads. Vintage stores like to use old advertising in their displays, etc. Steampunkers love old bottles and apothecary jars. As with most antique items, people are looking for typeset drawers to upcycle into curios for their walls. People are now collecting small things of interest and these drawers are the perfect size. One drawer usually sells for $45-65 depending on condition and size. Steampunk is a very popular style right now. Anything with gears is collectible. 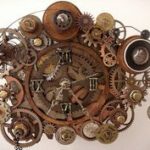 Old clock parts and jewelry are often upcycled into art and used for decor. I friend of mine makes art from old watches and jewelry. Never throw out anything that is over 100 years old. Someone will want it. 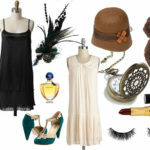 20’s fashion is always in style. The younger crowd loves it. Vintage clothing and accessories don’t sell for huge money, but they always sell. 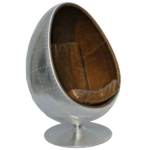 If you are lucky enough to own an egg chair, people will fight over it. The 50 something crowd LOVES mid-century modern and is willing to pay for it. Younger people love the fashion side of that time period thanks to the show, Mad Men. Anything from that time period is always hot especially if it is in good condition. Lucite is big right now too. Big chandeliers don’t seem to sell as well as minis. I assume that is due to the space constraints. 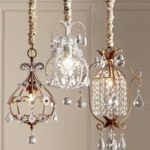 People under 50 are buying smaller homes there days and although the love the look of a chandelier, they want something small that can easily be taken down. We recently sold a mini chandelier for more money than the big ones we have. Floor lamps are popular right now as well. People are upcycling and rewiring them. 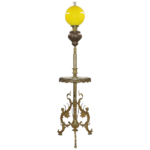 This type of lamp coordinates well with Shabby Chic and Steampunk decor. Country french is an off shoot of shabby chic. It is more country and less frilly. 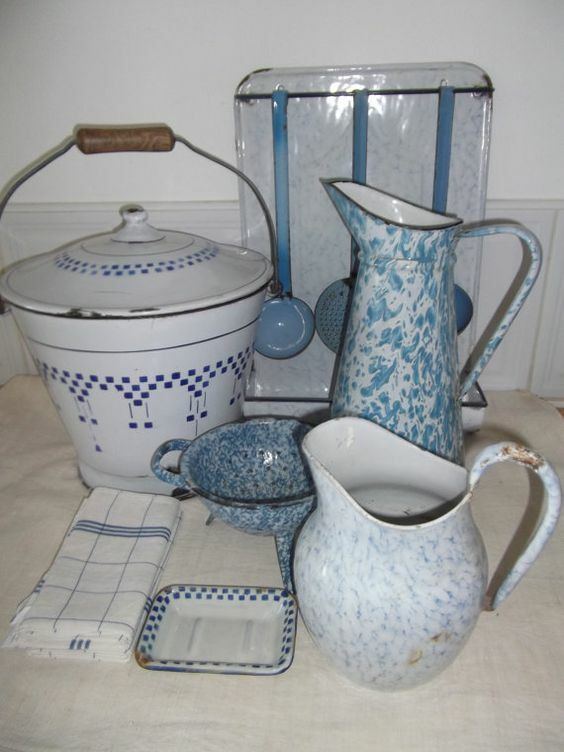 Antique enamel wear is very desirable in home decor right now. Hubley & Griswold are brands that always fetches top dollar at auctions, but cast iron always sells regardless. 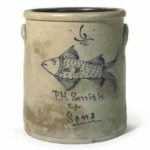 When I go to auctions, stoneware crocks always sell, especially on the East Coast. People use old crocks for storage and kitchen decor. If you have old crocks, you could get a lot of money for them online or at an auction house like Christie’s or locally at Meissner’s in New Lebanon, NY. This crock sold for over $6,000! Most crocks I see sell for $100-500 depending on age and condition. This year I am going to be doing DIY projects from items on the NOT list to show you how to recycle your unwanted family heirlooms! Baby boomers are getting older and downsizing while generation X is starting to collect antiques and using them to decorate their houses and businesses. People under 50 wouldn’t use a tureen in the conventional sense at a dinner party, but would use a nice Limoges tureen or bowl as a plant container or to keep art supplies in. The under 50 style is eclectic. People don’t use curio cabinets anymore. The under 50 generation collects things but doesn’t put them under glass as much. We want to play with our toys every once in a while. The last auction I went to someone from Canada bought ALL 100 hummels for $25-35 dollars each and we were all astonished because they usually sell for $5 each or not at all. Hummels are a good example of “sell when the items is hot, don’t wait hoping the price will go up even more.” Each generation has it’s own style. What is loved by parents is usually not loved by the children. So if you are hoping to sell your hummel collection, look up north. Canadians pay the most for Hummels. People don’t eat on china as much as they once did. We now live in a “disposable” society where eating out is now the norm. However, china IS HOT with DIY crafters. People are loving the shattered china table tops, jewelry and tiles. 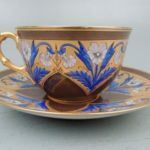 If you love your grandmother’s china and can’t bear to sell it for mere peanuts, you can make something out of it OR sell it online for craft supplies. Obvious exceptions are Tiffany, Cartier, etc., just don’t expect pre-2009 prices. Everyone loves crystal but few have the room or the patience to care for it anymore. Brands like Lalique, Baccarat and Waterford still sell but not at top dollar unless they are old and in perfect condition. If you have an old Lalique vase, it’s worth big bucks so there are exceptions to every rule. It’s all about demographics. Younger people just don’t value crystal like older people do. I LOVE CRYSTAL but I am an odd bird. 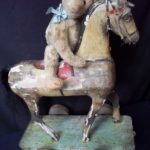 Most dolls and bears are very hard to sell, with very few exceptions. Barbies, Boyd’s Bears, Cabbage Patch Kids are all items I love but don’t sell. Everything has a cycle. If you love something, hold onto it. If it’s new in the box, it has a better chance of selling than if it has been played with. Porcelain dolls are almost impossible to sell regardless of age or value. My friend recently bought some gorgeous old french bisque dolls from the 1800’s and had a very hard time selling them. I love dolls and could care less if they sell or not. I still buy them because I love them. At every antique show we go to, people are trying to sell very nice dressers, buffets and china cabinets. What once sold for $1200 ten years ago is now selling for $40 IF you can sell it. It isn’t that people don’t need furniture, it’s that the demographic buying the furniture is different. People will pay big for an egg chair, or a French regency table, but not for an East Lake bed or dresser. Buffets are often upcycled with paint these days since no one uses china anymore. I often see buffets painted white and restyled into big lingerie dressers. Styles change often. If you want to sell your East Lake or Empire furniture, we suggest you paint it. Yes, it’s painful to cover up that gorgeous wood, but it might help sell it. I hope this was helpful to you. Let us know if you need information on anything. Text us a photo or bring in your items you want to sell. We will always be fair with you, even if we tell you something you don’t want to hear. We deeply appreciate you allowing us to be a part of your community. ← No Sew DIY Dog Sweaters for ALL SIZES!